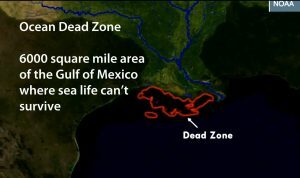 Region in the Gulf of Mexico with such a reduced oxygen state that sea-life cannot survive. This is an introductory statement to what I hope becomes a consistent and coherent train of thought regarding the Creation, our role as God’s image bearers, principles of Christian dominion, Creation Concern priorities, case studies, and opportunities to engage in stewardship actions at home and afield. Some of our favorite writers of fiction in the Christian community, Tolkien, Lewis, and others, have a passion for wild lands, for intact ecosystems. They make a strong case for the majesty of deep forests and for the often strange creatures found there. One of the main qualities of the enemies of good (Saruman, Shift the Ape) is their hunger for ecosystem destruction. Their hate of God’s diverse, complex, and intricate Creation is deep. They work to replace it with mechanisms of wood and stone and metal. I pray we allow our knowledge of the Lord’s handiwork to flow into meaningful principles and engagement. Let us take dominion as our shepherd and husband of the church demonstrated, with boldness, with understanding, with deep conviction. With knowledge of our role being primary, consider these verses. Think about them deeply and not necessarily in economic terms first. Also remember that environmental degradation which includes fouling of air and water, extinction, and other measurable physical consequences are ultimately caused by sin. A good sermon that touches on all of these topics and serves as a primer for our role in all of this.